Entergy Corporation, founded in 1913, is an integrated energy company engaged primarily in electric power production and retail distribution operations. Entergy owns and operates power plants with approximately 30,000 megawatts of electric generating capacity, including nearly 10,000 megawatts of nuclear power, making it one of the nation's leading nuclear generators. The company's 22-story headquarters is located in New Orleans. 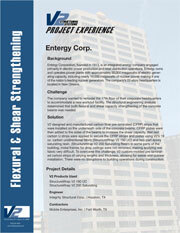 The company wanted to remodel the 17th floor of their corporate headquarters to accommodate a new workout facility. The structural engineering analysis determined that both flexural and shear capacity strengthening of the concrete beams was needed. V2 designed and manufactured carbon fiber pre-laminated (CFRP) strips that were installed on the underneath side of the concrete beams. CFRP plates were then added to the sides of the beams to increase the shear capacity. Wet laid carbon U strips were applied to secure the CFRP strops and plates using V2's 19 oz. carbon unidirectional fabric (StructureWrap V2 190 UC) and two-part epoxy saturating resin. (StructureWrap V2 200 Saturating Resin) In some parts of the building, metal frames for drop ceilings were not removed, making applying wet fabric very difficult. To overcome this challenge, V2 custom-molded pre-laminated carbon strips of varying lengths and thickness, allowing for easier and quicker installation. There were no disruptions to building operations during construction. Copyright ©2015 V2 Composites, Inc.